Vanillish in game: 298 Who? Important notice! Pokemon Vanillish is a fictional character of humans. Vanillish (Japanese: ????? Vanirich) is an Ice-type Pokémon introduced in Generation V.
Vanillish have large, white, rounded upper bodies with a swirled substance on top, making it resemble a scoop of vanilla ice cream. Its eyes are dark blue with small, ice crystals at the sides. 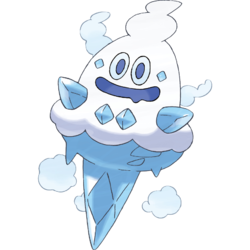 Vanillish has a dark blue mouth, two ice crystals below its mouth, and stubby, limbs that resemble icicles. It has a pointed lower body that resembles a large icicle. Vanillish lives in southern, snowy mountains, which it migrated to during an ancient ice age. 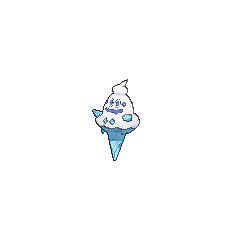 It composes ice inside its body by drinking water, and expels it to hide itself or freeze opponents. Vanillish debuted in The Mighty Accelguard to the Rescue!, where one was owned by Dr. Ferrara/Cryogonal Man. 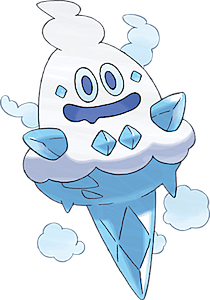 Another Vanillish made its appearance in Caution: Icy Battle Conditions! under the ownership of Brycen. 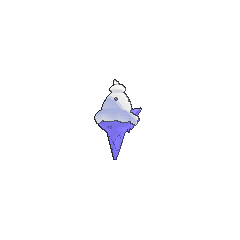 A Vanillish appeared in Thawing an Icy Panic! alongside Vanilluxe, where they were looking for Vanillite who has gone missing and caused a big snowstorm in Coumarine City. A Vanillish appeared in Performing with Fiery Charm!, under the ownership of a Pokémon Performer. It reappeared in Master Class is in Session!, where it was used in the Master Class Pokémon Showcase in Gloire City, and then again in Performing a Pathway to the Future!, where it was seen watching the same Master Class Pokémon Showcase. BW079 Vanillish Ash's Pokédex Vanillish, the Icy Snow Pokémon and the evolved form of Vanillite. Vanillish composes ice energy internally by drinking water from lakes or rivers. A Vanillish owned by a girl in Catelia City appeared in The Case of the Missing Pokémon, where they watch as Tep trying to find the person who kidnapped Bianca's Litwick. Brycen owns three Vanillish. They were first used to train Black's Pokémon while a single one was used to later battle Black in a Gym battle. It conceals itself from enemy eyes by composing many small ice particles and hiding among them. 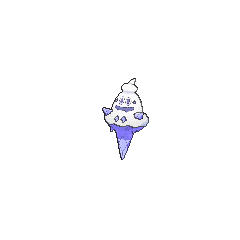 They cool down the surrounding air and compose ice particles, which they use to freeze their foes. According to Game Freak, Vanillish and its evolutionary relatives were drawn by James Turner.